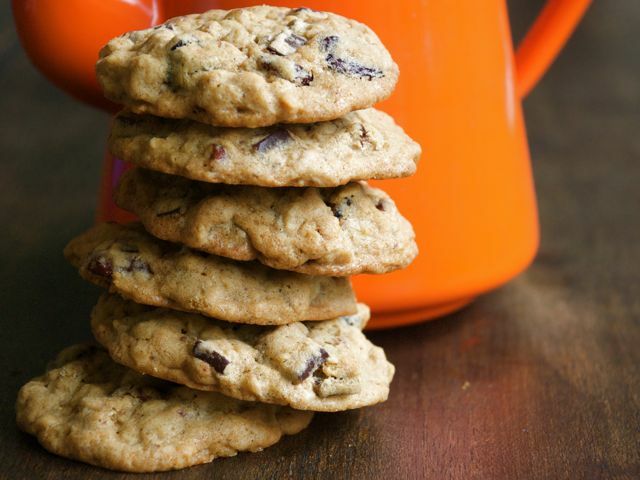 I've always liked the combination of flavors that comprise Cowboy Cookies — a hybrid oatmeal cookie with nuts and coconut. Here's my own variation on a theme with dried cherries and dark chocolate. Preheat the oven to 350 degrees. Line two baking sheets with silicone baking mats or parchment paper. In a large bowl, mix together the flours, baking soda, baking powder, salt, and cinnamon. In another large bowl (or the bowl of a stand mixer), cream together the butter and sugars until smooth. Add the eggs and vanilla, and beat until fluffy. Add the flour mixture, a third at a time, and mix until the dry ingredients are incorporated. Add the oats, pecans, cherries, and chocolate pieces. Stir until evenly distributed. Roll the dough into walnut-sized balls and place on the prepared cookie sheets. Bake for 12 to 16 minutes, rotating the pans halfway through the cooking time. Cool for 10 minutes on the pans, then remove to a rack to finish cooling.